Metformin vs. Sulfonylureas to Reduce Cardiovascular Risk? A comparative study from researchers at Vanderbilt University has determined that of the two most commonly prescribed oral diabetes medications—metformin and sulfonylureas—metformin is more likely to reduce the risk of suffering a cardiovascular-related event such as a heart attack or stroke. One of the most serious concerns for patients with diabetes is the significant possibility of developing cardiovascular disease (CVD). In fact, CVD accounts for most of the deaths in patients with diabetes. 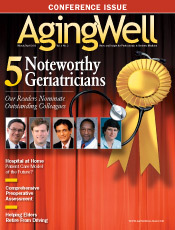 This issue is particularly profound for the nation’s elderly population. According to the National Institute of Diabetes and Digestive and Kidney Diseases, about 10.9 million US residents aged 65 and older (about 27%) had type 2 diabetes in 2011. Furthermore, in 2004, heart disease was noted on 68% of diabetes-related death certificates in people over the age of 65, while stroke was noted on 16% of those death certificates. The Vanderbilt study, which appeared in the November 6, 2012, issue of the Annals of Internal Medicine, involved the comparison of heart attack, stroke, and all-cause mortality outcomes in a group of about 250,000 veterans who received regular VA healthcare and were prescribed either metformin or sulfonylureas as their first diabetes treatment. The study results suggested that for every 1,000 patients treated with metformin for one year, there are two fewer heart attacks, strokes, or deaths compared with patients who take sulfonylureas, according to lead author Christianne L. Roumie, MD, MPH, an assistant professor of internal medicine and pediatrics at Vanderbilt University Medical Center and the VA Tennessee Valley Healthcare system. Allison Goldfine, MD, head of the section of clinical, behavioral, and outcomes research at the Joslin Diabetes Center and an associate professor of medicine at Harvard Medical School, calls the study “one of the best comparative effectiveness studies I’ve ever seen.” She points out that sulfonylureas were the first oral agents to be used in the treatment of diabetes and that they do have a long track record of safety. In light of the recent study findings, how should physicians frame conversations with patients regarding diabetes treatment? Roumie and Goldfine agree that healthful behaviors, such as engaging in daily exercise and making judicious food choices, are critically important in both preventing and treating diabetes. But many patients also will need medication. Of course, if a patient has impaired renal function, then possible drug treatments are limited to sulfonylureas or medications such as insulin, Roumie says. She adds that she would like to see the FDA reevaluate the renal threshold for using metformin, noting that the United States is more conservative with metformin use in patients with renal dysfunction compared with the renal thresholds used in Europe, Canada, and Australia. Roumie and her research colleagues estimate that up to 30% of patients with type 2 diabetes are taking a sulfonylurea drug, and she suggests that any patients considering changing medications first should talk with their physicians. As for any risk involved in switching medications, Goldfine says that while people can have adverse events with any drug, such events are rare and there are generally no problems associated with changing medications.